But, more than legends it is the stark reality that greets you wherever you go in Nepal in the form of the mighty Himalaya that never fails to inspire and instil a sense of awe in you. And there is perhaps no other city, quite like Pokhara from which to admire the immensity of the western Himalaya which rise out of the valley floor a mere 30 kilometers away! Your tryst with the beauty of the Himalaya are followed by a road journey to the Chitwan National Park where the story of one of the most successful conservation efforts in recent times continues to play out in this habitat of the Royal Bengal Tiger, one horned Rhino in addition to the sloth bear, wild boar, gaur (bison), 4 species of deer, 2 species of monkeys, 2 species of crocodiles, leopards and over 400 species of birds and various reptiles. This tour involves three half day sightseeing tours in Kathmandu and Pokhara and one and half days of activities in Chitwan. The tour will take you through the Kathmandu Durbar Square – whose temples are some of the finest specimen of Nepalese architecture and the Patan Durbar Square – noteworthy for its fine art and craft in addition to traditional Newari building styles. In addition the tour will also take you to the Pashupatinath Temple – one of the holiest Hindu shrines in the world and an important pilgrimage stop for Hindus, and Boudhanath Stupa – the largest Stupa of its kind in the world with dome-shaped structure with its all seeing eyes of the Buddha looking to the four cardinal directions. The flight to Pokhara is short but, the views can be breathtaking as the plane wings westward from Kathmandu past Mt. Manaslu (8156 m.) and the Annapurna massif including Mt. Annapurna I (8091 m.), two of the western Himalayan giants. A half day tour takes in the must see sites in Pokhara including the Davies’ Falls, Mahendra cave and the temple of Brindbasini. Spare time in Pokhara allows you to browse the lake side district, go boating on the lake, go zip lining, take in an ultra-light flight or go para gliding! Pokhara is fast turning into the “go to” destination for adventure activities in Nepal. Just 30 km to the north are 140 unbroken kilometers of the western Himalayan Range including Mt. Annapurna I (8091 m) and Mt. Dhauligiri (8167 m.). The horizon however, is dominated by a far smaller, but infinitely more spectacular peak – Macchapuchhare (6993 m.)or “Fish Tail” which seems to rise off the same valley floor 25 kilometers to the north and spectacularly ends in a “Fish Tailed” peak. Evenings in Pokhara has its own charm especially in the Lake Side district, dotted with fancy restaurants facing the Phewa Lake, lazy shops and simple guest houses with lush gardens that bloom year round. 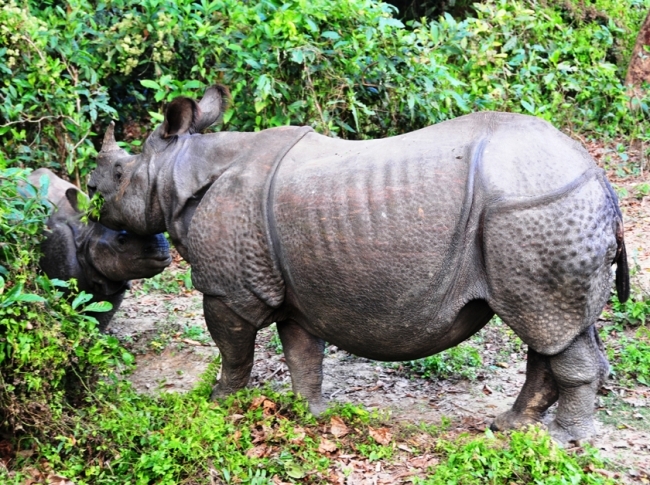 The drive to Chitwan National Park can take up to four hours through scenic villages and forests. The park is one of the shining examples in conservation efforts in this country. It is a sub-tropical jungle consisting 70% of teak forests bordered by the Siwalik and Mahabharata Ranges, dotted with marshes, swamps and lakes. Designated in 1973 as the Royal Chitwan National Park it covers an area of 932 sq km and is a remnant of the continuous band of forests and grasslands which once extended all the way from Pakistan to Burma. The Park is home most notably to the Royal Bengal Tiger and the great one horned rhinoceros among others. It is also the site of one of the most successful crocodile breeding programs which helped bring back the Gharial (a fish eating crocodile) back from the brink of extinction. Activities, here include jungle walk, elephant back safaris, jungle drives and canoe rides along the river. Day 02 Sightseeing tour of Valley .Sightseeing inlcudes of Patan city, Kathmandu, Pashupatinath Temple and Boudhanath Stupa. Day 03 Fly to Pokhara in the mid-morning, at leisure around the lake-side district. Day 04 Half day sightseeing tour of Pokhara Afternoon at leisure around the lake-side district. Day 05 Drive to Chitwan National Park in the morning and safari. Day 06 Full day of jungle activities. Day 07 Jungle activities in the morning, fly back to Kathmandu, remainder of the day at leisure. Day 08 Time permitting sightseeing, transfer to the airport and depart from Nepal.